The Flea Theater is proud to present acclaimed pianist Kathleen Supové in KATHLEEN SUPOVÉ & THE ELECTRIC SHEEP. This eclectic evening will feature two world premieres, a New York premiere, and a piece for speaking pianist. All tickets are only $15 for this limited engagement playing December 17-19 at The Flea Theater in TriBeCa. One of America’s most acclaimed interpreters of contemporary music for piano and keyboard, Kathleen Supové brings listeners four engagingly futuristic pieces by emerging composers in this evening of cutting-edge new music. The program includes the world premiere of ELECTRICSHEEP, a piece for piano and LEMUR musical robots by Chicago-based composer Marc Mellits.FETCH by New York composer Derek Bermel (text by Will Eno), the New York premiere of Peteris Vasks’ SPRING MUSIC, and another world premiere, a Debussy “remix” based on THE CHILDREN’S CORNER by Brooklyn composer Matt Marks, complete this state-of-the-art concert. 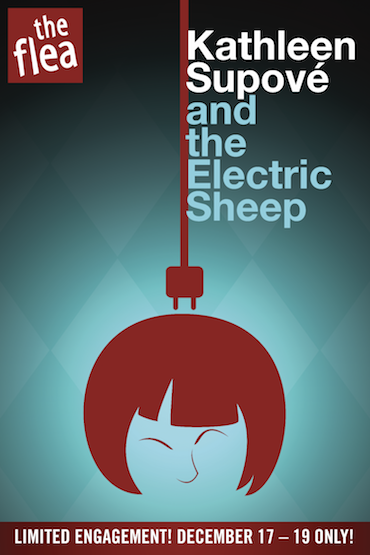 KATHLEEN SUPOVÉ & THE ELECTRIC SHEEP runs December 17-19, Saturday at 9:30pm, Sunday-Monday at 7pm. The Flea is located at 41 White Street between Church and Broadway, three blocks south of Canal, close to the A/C/E, N/R/Q, 6, J/M/Z and 1 subway lines. Tickets are $15 and are available by calling 212-352-3101 or online at www.theflea.org. Kathleen Supové has commissioned, premiered and performed countless works by emerging and important composers and, in always being at the forefront of seeking out new voices, she has established herself as an integral part of recent music history. Her concerts are presented under the name of The Exploding Piano, often initially at The Flea Theater. This past season she was a featured artist at such defining events as the Other Minds Festival in San Francisco and the Pianists At The Edge series at University of Pittsburgh. She has commissioned a body of works for piano and electronics, as well as works for Yamaha Disklavier. In 2001, Ms. Supové became a Yamaha Artist. Her most recent CD, INFUSION, appears on the Koch International Classics label. She has appeared with The Lincoln Center Festival, The Philip Glass Ensemble, Bang On a Can Marathon, Music at the Anthology, Composers’ Collaborative, Inc., and at many other venues, ranging from concert halls such as Carnegie to theatrical spaces such as The Kitchen to clubs such as The Knitting Factory, The Stone, and The Cutting Room. She also performs in the concert theater piece, Removable Parts, along with composer/vocalist/actor Corey Darge.